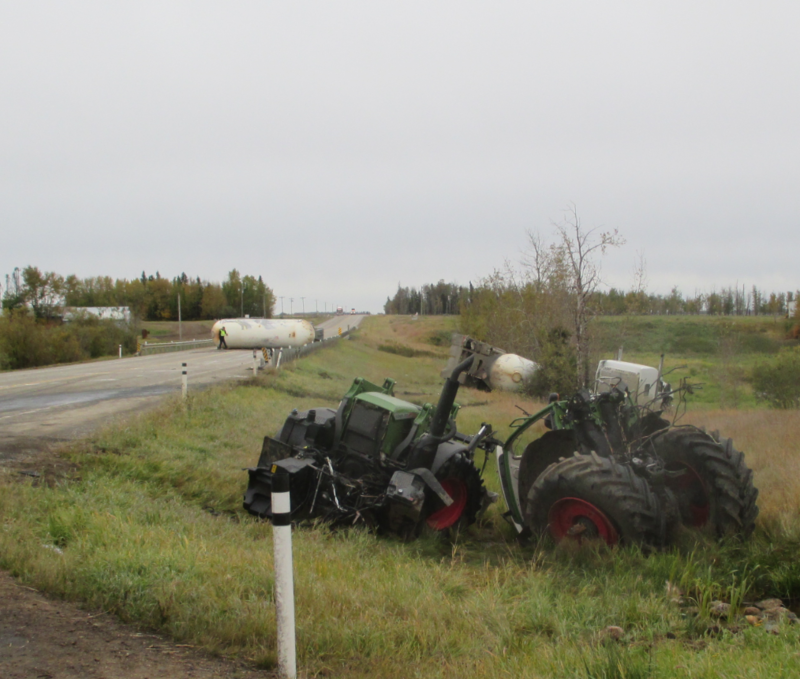 On Sept. 25, 2018 at 8:30 p.m., Westlock RCMP responded to a motor vehicle collision north of Westlock on Highway 44 near Township Road 614. Preliminary investigation has determined a farm tractor was crossing the highway from the east. A southbound semi tractor with double tank trailers of liquefied petroleum gases was unable to avoid a collision with the tractor as it entered the highway. Both the semi and farm tractor were forced into the west ditch area. A southbound truck that was behind the semi tractor was unable to avoid a collision with a trailer that remained on the highway. Both lanes of Highway 44 are still being re-routed around the scene. A Hazmat team is currently on the scene removing the gas from the tankers. The tank trailers were not compromised in either collision. The male drivers of the truck and tractor were transported to hospital via EMS with serious but non-life threatening injuries. The driver of the semi-tractor was not injured. Westlock RCMP continue to investigate this collision and an update will be provided once the highway is cleared.